Toni Gerdes Needlearts - ﻿NEW CLASSES !!! Below are some of my designs. Also see MORE CLASSES !! & EVEN MORE CLASSES !! on the next pages of the website. Fire & Ice This dramatic depiction of Fire & Ice flames the imagination with an inferno of hot combustion & icy crystals. 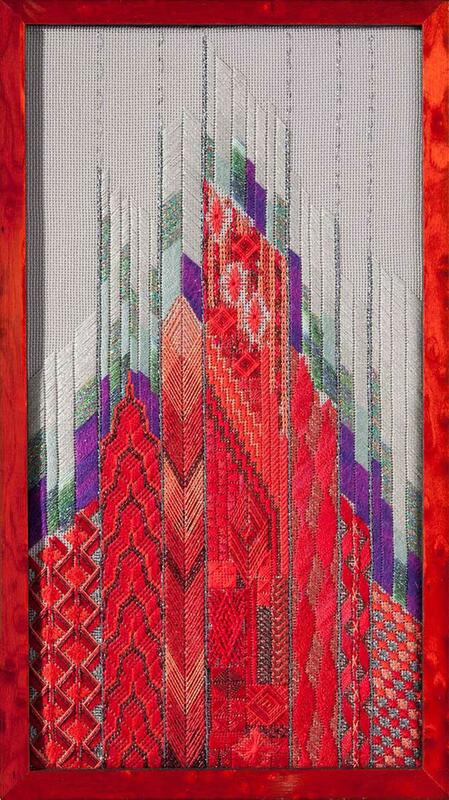 You will explore many different shades & textures of red threads as you create the towering red polygons that burst into flames; these include Gloriana silk, cotton, Planet Earth silk, Thread Gatherers cotton, Empress Silk, Treasure Braid & Petite Silk Lamé Braid. On the beautiful smoke gray Congress cloth the ice crystals form above the flames in vertical parallelogram shapes using purple, green and metallic white threads including Petite Silk Lamé Braid, Sparkle! Braid, & Gloriana silk. This intermediate level design is approximately 5 1/2” x 10”. This can be taught as a 2-day or a 3-day class. Bronze Purse Bronze, brass, & copper highlight this stunning purse flap. You will explore many separate motifs in this piece. A beautiful brass filigreed clover leaf creates the focal point of the flap, while the combination of metallic and silk threads crafts the areas that will enhance the clover leaf. The threads look beautiful on the Soft Mocha Congress cloth and include Silk Lamé Braid, Sparkle! Braid, Kreinik metallic braid, Accentuate, Bijoux, Overdyed metallic thread by ThreadworX, Impressions & Needlepoint Inc. silk, along with beautiful square Tila Beads by Miyuki. This intermediate level design is approximately 6” x 12”. Each student will receive the unique lining material to finish their flap which has purse patterns covering the fabric. This is a 2-day class. Tulip Trio Spring will burst from your canvas when you stitch this Tulip Trio. 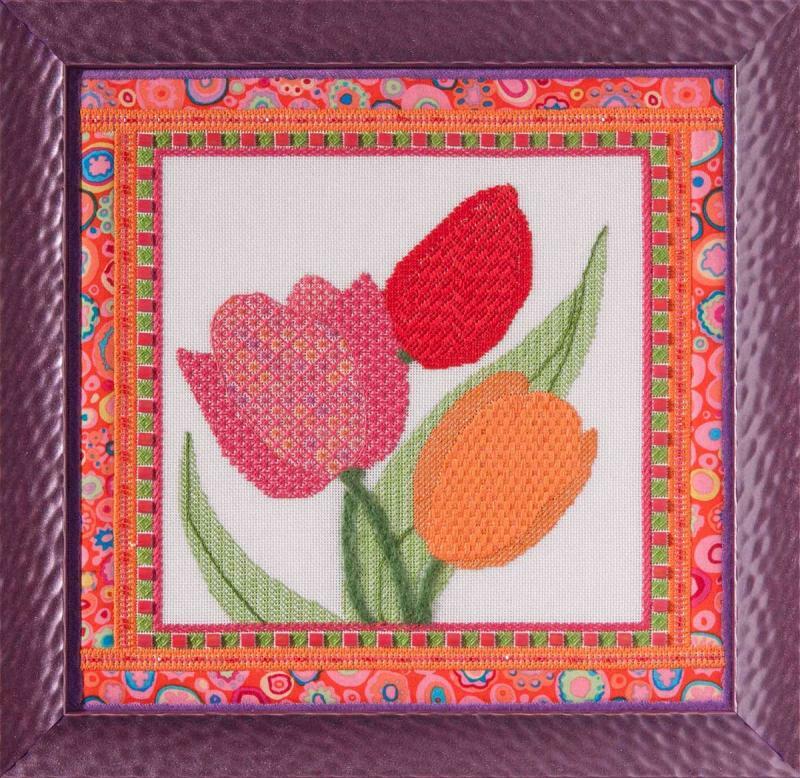 The five border frame compliments the tulips with four stitched borders and one using padded fabric appliqué. 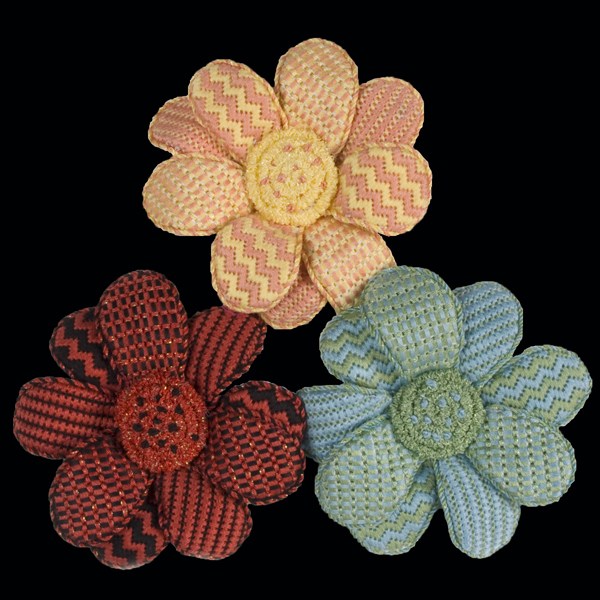 There will be choices of several different spring colored fabrics to individualize your piece. Tulle fabric will be used to create the sheer leaves with stitching added to outline and show the veins and folds of the leaves. The tulip stems are needle felted right on to the canvas with several shades of green roving. The tulips will be stitched using laid filling stitches and bargello. 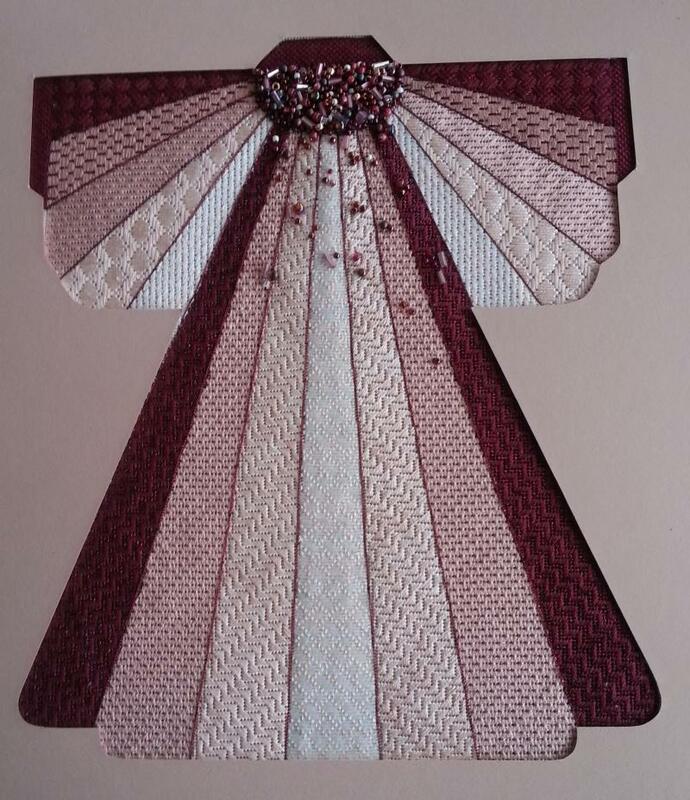 This intermediate level class on white Congress cloth finishes to a 9.5” x 9.5” design. You will use many interesting threads to create your spring masterpiece including, Gloriana silk, Mandarin Floss, Planet Earth silk, Sparkle! Braid, and fun square beads. This is a 2-day class. Empire of the Sun is a kimono based on the Japanese flag design with its traditional rays. In this intermediate level class you will create beautiful shaded rays in your choice of a wine/beige colorway on eggshell congress cloth or a teal/gray colorway on light gray congress cloth. At the top of the design representing the sun you will make a beaded half circle filled with a wide assortment of beads to create a lush rich sun. The beads will spill over onto the kimono to trickle down the back and add sparkle to the rays. The design size is approximately 9” x 12”. The rays are stitched in 5 shades of stranded Soie Cyrstal silk. This is a 2-day class. Jewel sparkles like a beautiful gemstone combining greens, blues & lavenders in this wonderful geometric design on white Congress Cloth or on 18ct white mono canvas. In this class you will explore combining some Jean Hilton stitches with beautiful complex laid filling stitches to create your Jewel using a variety of metallic threads and a bit of silk, including Rainbow Gallery Sparkle! Braid, Highlights, Treasure Braid, Accentuate, Au ver a Soie, Soie 100/3, beads, and a beautiful Swarovski crystal. This is an advanced-intermediate level design & finishes at 10” x 10” on Congress cloth and 13 ½” x 13 ½” on 18ct. This can be taught as a 2-day or 3-day class. Leah Ornament Do you appreciate the antique glass Christmas ornaments of old. The Leah Ornament is based on those glass ornaments, but is not breakable. This one day intermediate level class on light blue congress cloth uses cotton & silk flosses along with a couple of sparkly threads and rich glass beads to create a beautiful, rich gemstone colored design of blue, green, & violet. You will learn an interesting “Hot Foil Technique” using a deep metallic blue, which will be applied before stitching begins. 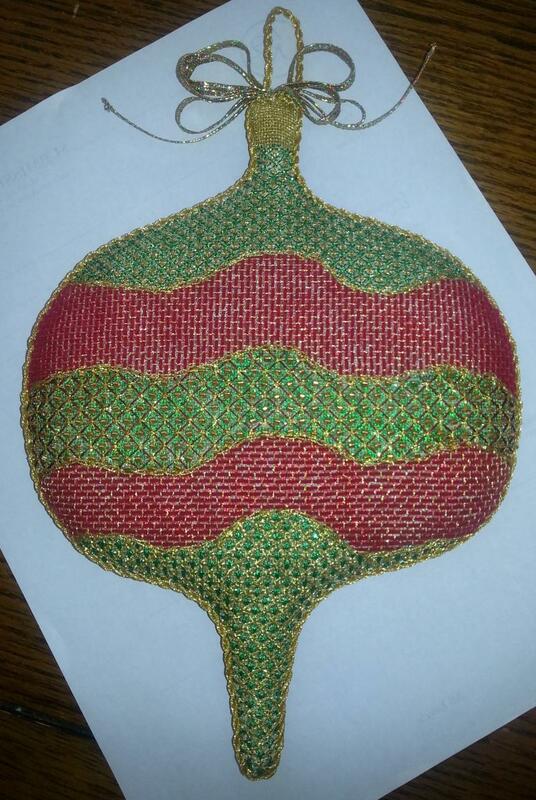 The finished ornament with its graceful curves is approximately 5” x 4” and will look beautiful hanging anywhere you choose. Your kit will include all threads, the wonderful foil and applicator, along with everything you need to create a wonderful heirloom ornament. This is a 1-day class. Pretty Petal Pin is a wonderful piece of wearable "needle art". This intermediate level piece is a colorful multi-level pin with 3 color-way choices; peach/yellow, blue/green, or black/red. In this 6-hour class, you will learn 5 stitches including a fun ruching-coiling technique. 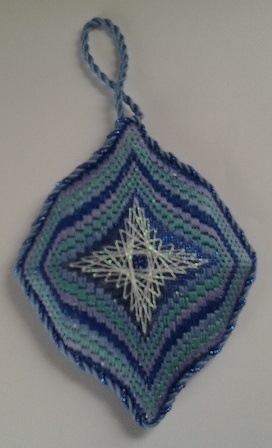 The finished piece is approximately 3 1/2" in diameter. 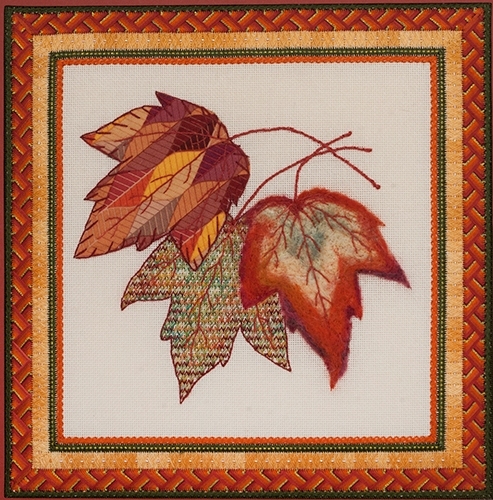 The kit will include 18 ct. mono-canvas, all threads needles, and instructions. This is a 1-day class. Zuni Sunrise is a small, but precious piece of needleart studying the specific colors of a western dawn sky. The design represents the earth, sun, and mountains. The addition of the small stone fetish makes the piece special as a protector for the recipient of this piece. In this 1-day intermediate level, canvas embroidery class, using silk, wool, cotton, and Sea Grass threads, you will make Zuni Sunrise come alive with color, study the history & beliefs of the Zuni and their fetishes, and learn about attaching embellishments. The piece is a companion to Zuni Sunset and can be finished several different ways including a wonderful small box. Design Size: 2” x 6” This is a 1-day class. Zuni Sunset is a small, but precious piece of needleart. The design represents the earth, sun, and mountains. The addition of the small turquoise bear fetish makes the piece special and, since the bear fetish is a symbol of health, strength, introspection, and power for the soul, will be a protector for the recipient of this piece. In this 6-hour class using wool, silk, cotton, and Sea Grass threads, you will make Zuni Sunset come alive with color. 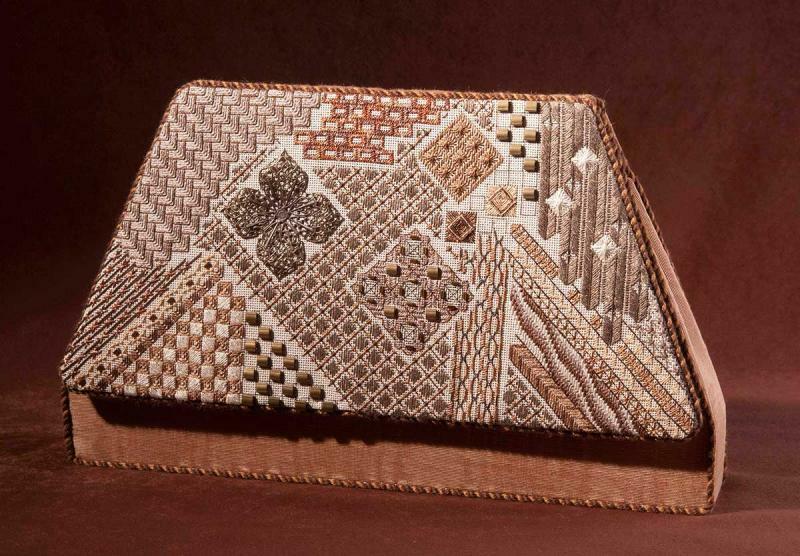 During the class, the student will receive a small history lesson on Zuni Fetishes and the tribes beliefs revolving around these fetishes, learn several fun stitches, and learn how to attach a small object to canvas. This is a 1-day class. Christopher Ornament is a beautiful classic Christmas ornament design based on the antique glass Christmas ornaments of old. 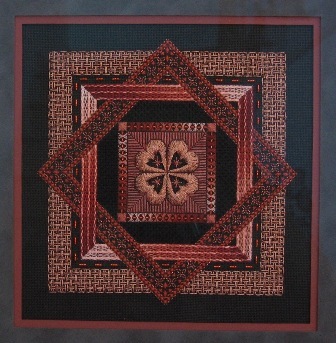 This one day intermediate level class on white congress cloth uses many different threads in a traditional red, gold, and green color scheme, including two types of metallic threads along with gold triangular beads. An interesting “Hot Foil Technique” will be applied before stitching begins. You will explore layered stitches and what happens when you reverse the order of stitching. Design Size 7" x 9". This is a 1-day class. Golden Ginkgo Kimono is a beautiful kimono which shows the seasonal changes of a Ginkgo tree expressed with silk, metals, and an interesting “Hot Gold Foil Pen” technique on ecru congress cloth. 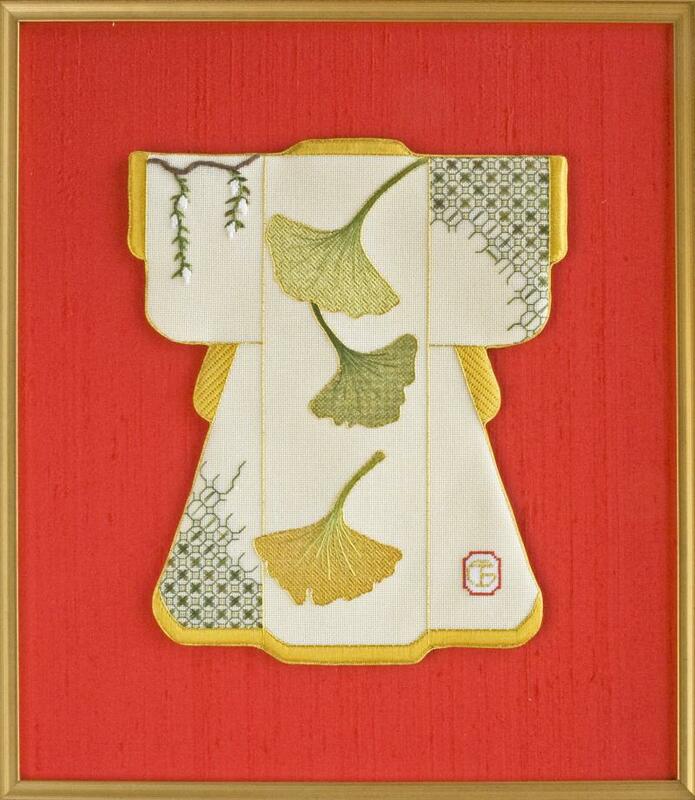 In this 12-hour intermediate- advanced level class, you will personalize your kimono by choosing your own Ginkgo leaf shapes and their placement. You will learn several stitches, including a wonderful blackwork lantern pattern, along with, a new over-shading technique. To finish your kimono, you will design your own signature seal, sometimes called a “chop”. This is a 2-day class. 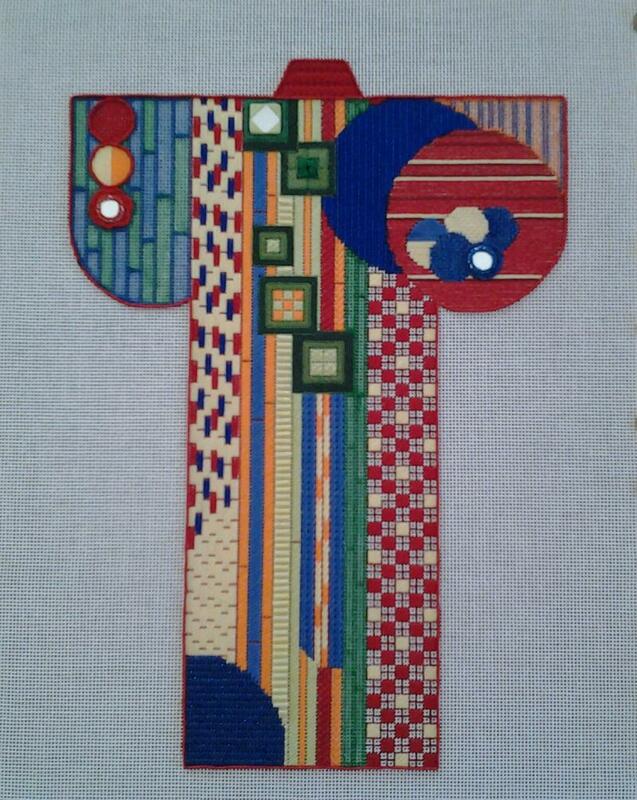 The Wright Kimono is my latest kimono, based on a selection of Frank Lloyd Wright windows, his teachings and ideas. This 2-day, intermediate level class will be fun and also, teach the “perfect circle” concept, some color theory, & some history. 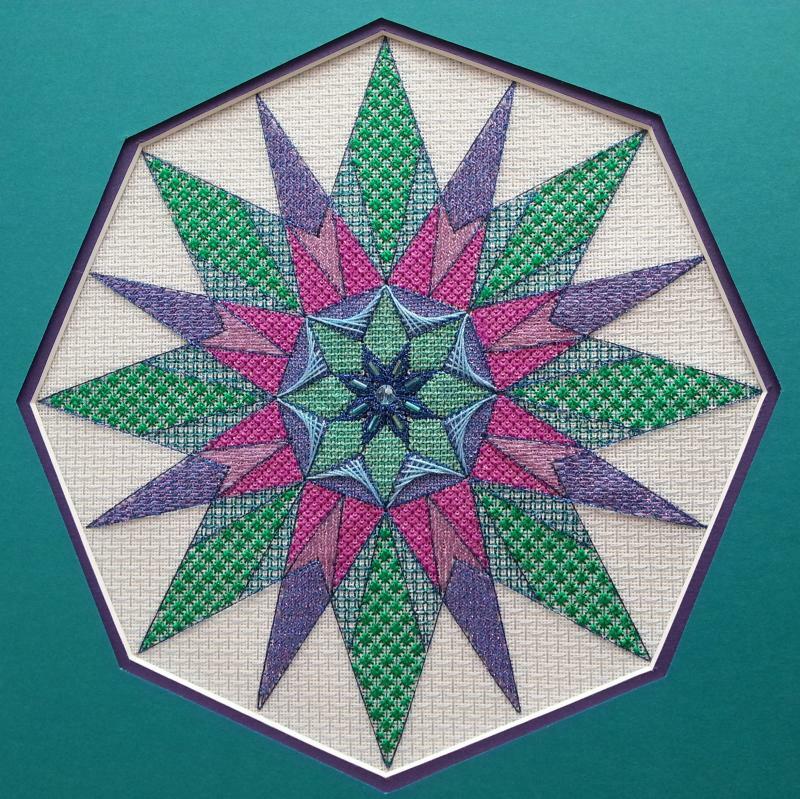 Stitches will be taught that enhance the vertical & circular design areas, including learning to stretch Flair & appliqué it to canvas and also, you will learn to attach mirrored tiles to the design. Design Size: 8” x 11 ½”. This is a 2-day class. Hearts & Ribbons is a gorgeous 4-way geometric that uses silks, braided metallic cords, overdyed cotton, and beads to contrast with a dramatic black background on congress cloth. 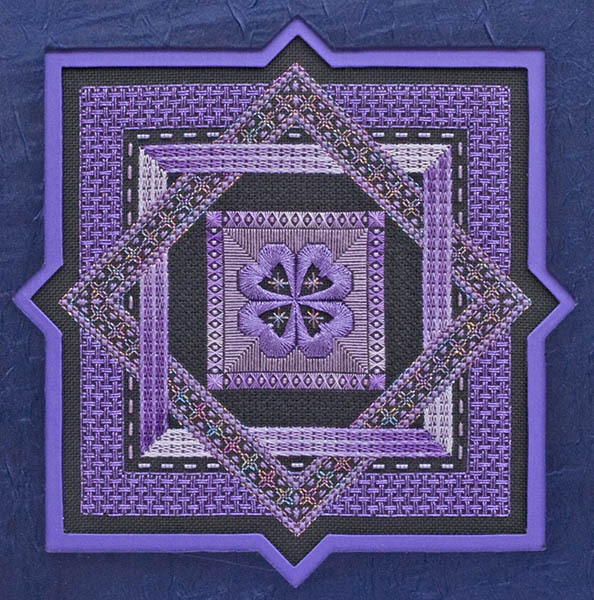 In this 12-hour advanced-intermediate level class, you will learn several stitches, including Fleur-de-lis hearts, Half-Rhodes, a wonderful faux-woven stitch for the outer border, along with, 2 types of bead embellishment. You will, also, learn a technique of combining several simple stitches to make an elaborate ribbon border and an interesting over-shading method. This is a 2-day class. Geometric Butterfly is a wonderful design inspired by the teachings of Frank Llyod Wright. This intermediate level piece is a colorful fun piece. In this 2-day class, you will learn several stitches, specifically focusing on shading techniques. The finished piece is approximately 3 5/8” by 7 5/8”. You will be working on 24 count Congress Cloth, which will be included in your kit along with all threads, needles, and instructions. The threads in the kit include Rainbow Gallery silk, DMC Floss, Soie d’Alger silk, Thread Gatherer’s silk, and Gold Coronet Braid by Rainbow Gallery. This is a 2-day class. “Let It Snow” is a wonderful winter piece that uses many variations of Jean Hilton stitches for the snowflakes. The snowflakes, on 18 ct. mono canvas (Red, Lavender, or Leventeen Blue), are framed with an intricate and beautiful seven row border. 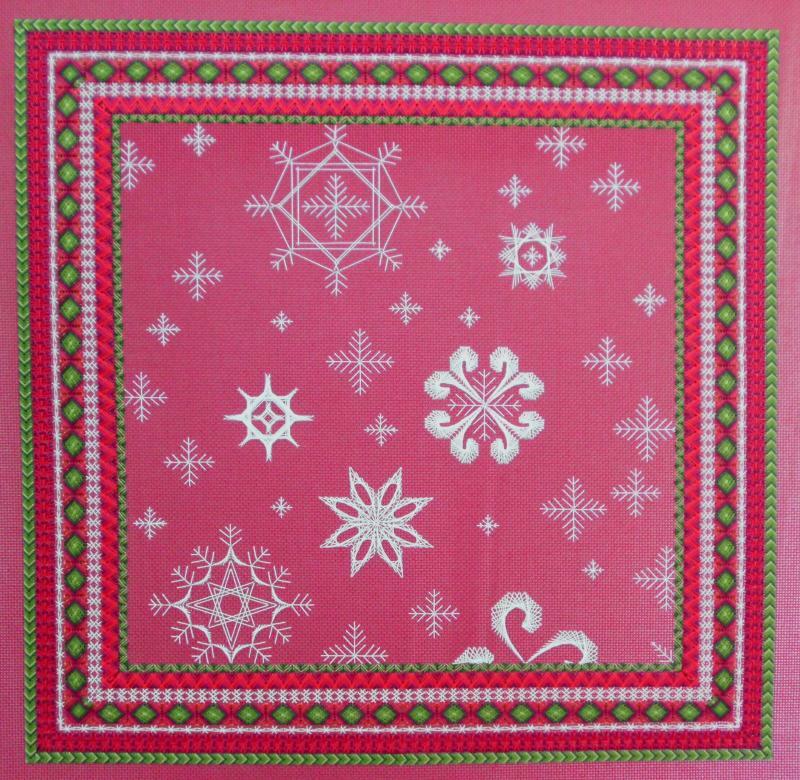 The border, stitched in red/lavender/blue, green and white (depending on the students choice), sets off the minimalism of the snowflakes with its detail and beauty. The use of Rainbow Gallery Sparkle! Braid, for the snowflakes, represents the snow with just a bit of sparkle; just as the snow looks on a frosty morning when the sun shines on the fresh white snow. Five shades of DMC red, lavender, or blue floss and four shades of DMC green floss along with a repeat use of the white Sparkle! 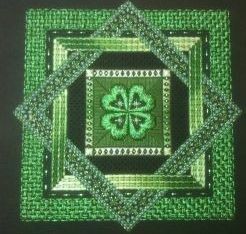 Braid combine to make a complex shaded border for this beautiful piece. The other color choices of Lavenders & Greens or Blues & Greens make soft winter scenes. The student will need to bring 19” x 19” stretcher bars, normal stitching supplies, and light, magnification, and frame holder. This is a 2-day class. Royal Kimono is a beautiful sampler kimono. 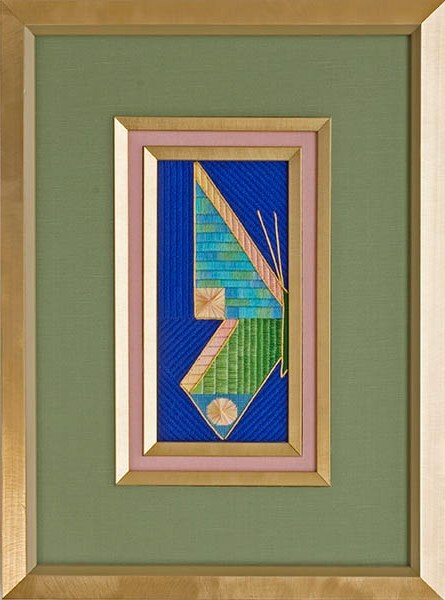 The many colors of gold thread, used together in this piece, weave a tapestry of gold. Using many different silks, linen, nylon, rayon, cotton, velvet, and one metallic thread, in the same color family, shows off the texture of the threads in the vertical, horizontal, and diagonal stripes, and in 2 overall design areas. The numerous stitches that you will learn in this sampler piece create a tapestry fabric for the kimono. The kimono is stitched on 18 count eggshell mono canvas and is at Intermediate Level. Picking your own special color of silk to mount, mat, or finish this piece and coordinating that color with your own designed chop will make this piece the highlight of any home. We will discuss & design a personalized chop in class and discuss color choices for finishing. Design Size: 7½” x 8 1/2". This is a 2-day class. Golden Petals, a small piece, approximately 4” x 6”, focuses in on one small flower, but creates a beautiful design with the use of goldwork petals and leaves. The petals and stems use a technique of wrapping silk thread in the grooves of the gold to finish with a two-color effect. The basket is stitched with a woven stitch and metallic thread to create the look of an elegant real basket. The top and bottom of the basket finish off the piece with a nice edge. Design size: 4” x 6”. This is a 2-day class.